Buffalo check has been around for ages and there’s a good reason why since this print is such a classic and beautiful style. It’s big, bold and attention-grabbing which is so versatile and can be used in all sorts of spaces in your home. Create awesome focal points in your home with these great ideas. Spruce up your home office with this gorgeous wallpaper that will add some style and flair in your home. You don’t have to cover all four walls with it but can make a feature wall inside your space. If you want to add some added style to a simple bedroom, then some printed bedding with buffalo check on it will do nicely. It makes it look so much more modern and contemporary but do keep the rest of the decor simple so that it won’t be too overpowering. Your living room will be the place where most of your guests gather so you want to make sure that you have lots of comfortable seating options for them. This sofa covered in buffalo check is a really chic idea and coupled with the colourful throw pillows, it will make it look striking. In the midst of your redecorating, make sure you don’t miss out on your kitchen, one of the busiest places in your home. Give it a new, refreshed look by just changing the kitchen blinds to a black and white buffalo check while doing the same for the carpet as well. 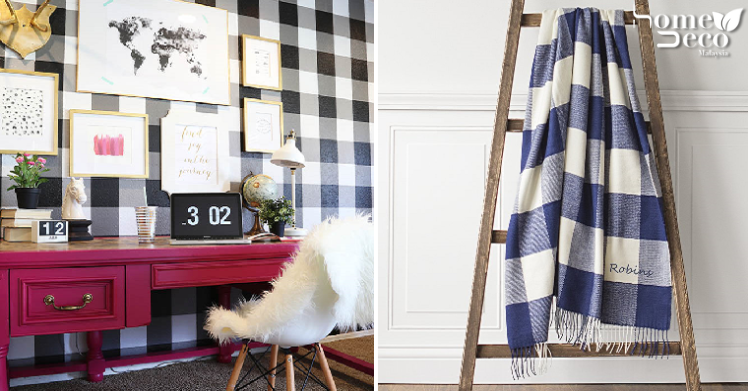 Add a pop of colour and patterns on a chair, sofa or even your bed with this comfy and cosy buffalo check blanket that is so versatile. Buffalo check comes in many colours and we are loving this blue and cream one that can be used for almost anything. Ottomans are great seats when you are running out of space or just need some extra chairs when you have many guests over. These buffalo check ones can be slotted under a table or hidden somewhere but since it looks so gorgeous, putting it on display works fine too.